Recent disappointing economic activity from China has markets and observers around the World nervous. Everyone is wondering how severe the conditions are and what the potential impacts may be. Agriculture has not been insulated as market commentators have recently cited these concerns in response to nervous commodity markets. This is a significant change in tone from just a few years ago when rapid economic growth in China, fueled by its population of 1.4 billion and rising incomes, helped power the recent boom in agriculture. Concerns are mounting that a slowdown in China’s economy may exacerbate the current downturn in U.S. agriculture. To better understand how China interacts with the global agricultural market, we took a look at 11 commodities and how China’s production, consumption, and imports of these commodities scale at a global level. Data for this were collected from the USDA’s Foreign Agricultural Service (FAS). Corn: Corn production in China has tracked with consumption over time. While consistently trending upward, growth in both production and consumption has slowed in the last three years. This comes after the 5 preceding years being noted for rapid growth. China has imported corn at various time in history. In recent years however, the longest sustained period of corn imports has taken place. China imported up to 5% (left axis) of the world’s total corn imports recently but currently accounts for 2% of total global corn imports. Soybeans: The most dramatic impact China has on a single commodity can be observed with soybeans. Since the early 2000’s, China’s consumption of soybeans has sharply outpaced production, leaving China to account for a very large share of global soybeans imports. Over the last 20 years, China’s imports of soybeans increased at an average annualized rate of 19.4% (not shown). Today, China accounts for more than 60% of global soybean imports and 30% of soybean consumption. This trend has been nothing short of fascinating. While China is heavily reliant on soybean imports, it’s worth noting that soybeans are a fairly small crop for the county overall. The latest consumption estimate for soybeans is 91,700 thousand metric tonnes; compared to 219,000 thousand for corn, 116,500 thousand for wheat, and 151,000 thousand for rice. Wheat: While growth in corn and soybean consumption has been nearly exponential over time, wheat consumption in China plateaued in the 1990s and has remained fairly consistent since. Production has followed the same trend. Most recently, production has exceeded consumption, leading to less wheat imports. Also illustrated in the figure is a downward trend in China’s share of total global wheat imports. The underlying data show that China has imported smaller quantities of wheat while total global imports of wheat have risen. Rice: In the last three years, China’s consumption of rice has exceeded production. This corresponds with a surge in the share of global imports that China accounts for. It’s worth noting that China most recently accounted for 12% of total global rice imports, the highest share in 45 years. Cotton: While the previous charts have all trended upward, cotton consumption and production can be characterized by a sharp increase in the 2000’s followed by a recent declines. Both consumption and production have followed this trend. Most recently, cotton consumption has exceeded production. China currently accounts for a large share of total cotton imports, but considerably lower than just a few years prior. Dry Powder: Similar to soybeans, China’s consumption for dry powder whole milk has exceeded production for several years. This corresponds with an uptick in China’s share of global imports. Currently China accounts for 46% of total dry powder milk imports; historically high levels but off record levels of more than 60% set in 2013 and 2014. Fluid: China’s appetite for milk also spills over into fluid milk. While China’s production and consumption have remained nearly lock-step, China has represented a larger share of total global imports in recent years and currently accounts for 41%. Overall, imports of fluid milk are very small in China and globally. Fluid milk must remain cool; creating complicated logistic factors. Globally fluid milk imports account for 0.1% of total consumption. In China, imports account for a slightly larger proportion at 0.9% of total consumption. China’s most popular nut, by tonnes of consumption, is walnuts. For the last several years, consumption has exceeded production. While not shown, since 1999 imports of walnuts has increased an average of 22% annually in China and 16% globally. Currently, China accounts for nearly 16% of global imports. Data are also available for almond and pistachios. 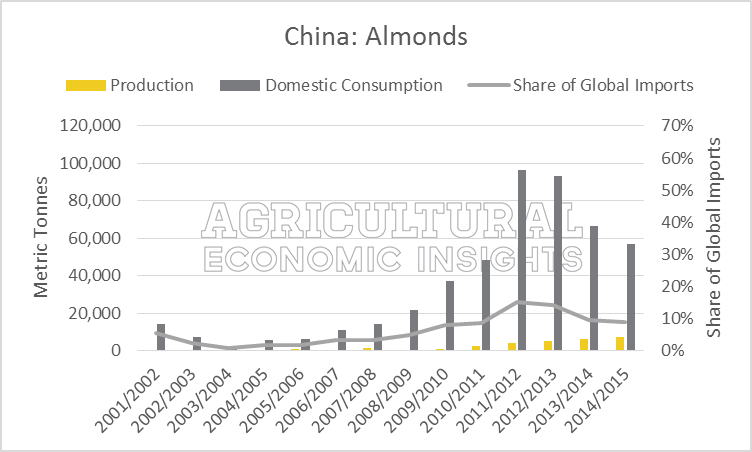 China has very little production of almonds and none reported for pistachios. 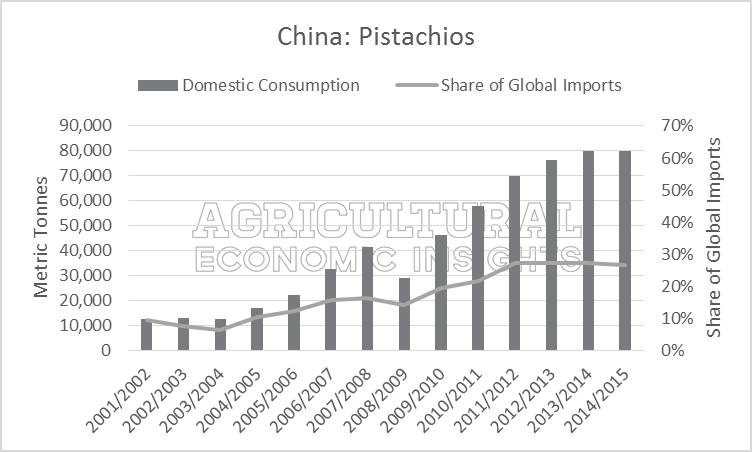 The trends for almonds are available here and pistachios here. Pork: China accounts for 52% of global consumption of pork. Production has mirrored the upward trend of consumption, but has fallen behind in recent years. This has led to an increase in China’s pork imports. Since 2000, pork imports have increased at an average annualized growth rate of 17% (not shown). Currently, China’s pork imports account for 13% of global activity, a record-high observation in the data. Chicken: While China accounts for only 15% of total chicken meat consumption, two interesting trends should be noted. The first is the downward trend in share of total imports that China accounts for. After peaking at 14% in 2000, China currently accounts for only 3% of global imports. The underlying data reveal that China has reduced the actual tons of imports it purchases. Furthermore, since 2009 China has been a net exporter of chicken. The second trend has been for lower consumption and production of chicken has been observed since its peak in 2012. Beef: China’s production and consumption of beef have both trended upwards with large growth rates experienced during the early 1990s. More recently, consumption of beef has increased while production has remained fairly consistent. This has resulted in a significant increase in beef imports (up from 99 thousand metric tonnes in 2012 to 500 thousand in 2015). As a share of total imports, China currently accounts for a record-high 12%. Strong Global Impact: Soybeans and Dry Powder Milk. The global market for these commodities will be heavily influenced by China’s future economic activity. China relies heavily on, and accounts for a large share of, global imports of soybeans and dry powder milk. Any changes in consumption, upward or downward, will immediately spill into these global markets. As China goes, so goes the demand outlook for the commodities at the global level. Growing Global Impact: Beef, Corn, Cotton, Pork, Rice, and Walnuts. China has strong production and consumption of these commodities with some reliance on imports. Beef, Corn, Pork, and Walnuts have just began to notice the impact of China turning to the global market for imports. In the short-run, any changes in consumption for these commodities will be strongly noticed by the global markets. In the long-run China’s policy, consumption, and production trends will untimely determine if China’s imports expand, moderate, or contract. Limited Global Impact: Chicken and Wheat. For these commodities, production and consumption have experience limited growth in recent years, even contractions, and have resulted in China accounting for a smaller share of total imports. The role China plays in global agriculture varies significantly by crop. Conditions like those observed in soybeans, the poster-child of how China’s growing economy can create significant influence in the market, have not been observed widely across all the commodities evaluated. The impacts of a slow-down in China’s economy will vary greatly by industry and commodity. It’s important to recognize how China’s influence on global agriculture varies by commodity and monitor the trends moving forward.